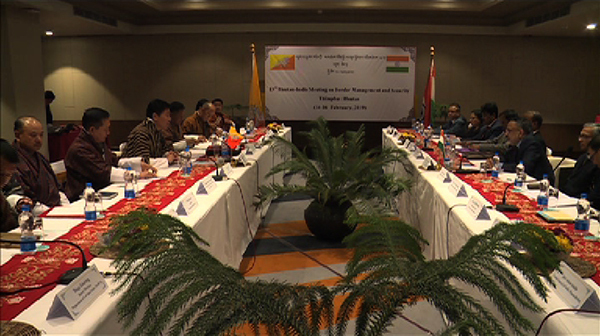 The 13th Bhutan -India meeting on Border Management and Security was held in Thimphu today. The Bhutanese delegation was led by the Home Secretary, Sonam Tobgay and the Indian side was led by Indian Home Secretary Rajiv Gauba. At the meeting, both sides reaffirmed its commitment to further strengthen the existing relationship. The meeting noted that while the security situations have improved along the border areas, the relevant agencies of both sides will continue to strengthen the existing mechanisms. Both sides expressed satisfaction on the present mechanisms of information sharing and cross border coordination at all levels. Also, curbing cross border crimes, improving coordination between the counterparts of the two countries, strengthening security arrangements and other mutual concerns were discussed. The next round of the meeting is scheduled to be held in India.